HAMPTON, Va. (July 29, 2018) — Each summer, Hampton University hosts a campus-wide Pre-College program for incoming freshmen. One department, however, offers a very specific and unique Pre-College experience for their entering freshmen students. Hampton University’s Department of Computer Science offers their Pre-College students attendance at absolutely no cost for the entire summer program, and work to ensure that they are ready for the rigorous curriculum come fall. “The Pre-College experience is vital for future Hampton University students to gain leadership skills, to meet friends, and to excel academically to ensure future success, and it’s truly amazing that the Computer Science students have this unique opportunity available to them,” said Hampton University President Dr. William R. Harvey. 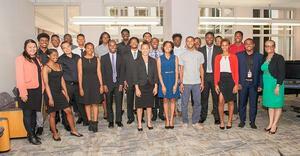 The Computer Science Pre-College program first started with the help of a National Science Foundation (NSF) Historically Black Colleges and Universities – Undergraduate Program (HBCU-UP) Grant in 2014. There were many students majoring in Computer Science who began the program but were ill-equipped with the necessary tools to be successful. “Our retention rate was not high and we had to do something about that and so we received the HBCU-UP Grant that looked at our curriculum and helped tweak it, but more than that, it gave us a Pre-College program and to see if we can bring those incoming freshmen in, prep them for what they did not get in high school, such as programming and math deficiencies, and to set them up for success for their four years here at Hampton University,” said Dr. Jean Muhammad, Chair of the Hampton University Department of Computer Science. The Hampton University Department of Computer Science Pre-College program is completely free for incoming freshmen students who are Computer Science majors and will be attending Hampton University in the fall following the summer program. Students take two classes, a math course and a programming course, stay in the dorms for the 5 weeks of the program, are given books and a meal plan, and there is no cost to the students. “This is a great recruiting tool for us, the parents can send their students to us to get prepared for the fall and they won’t have to worry about the cost of the summer. The only thing they pay for is the travel to the campus and the travel home, but books, class, everything is free. They get credit for those courses they take as well,” said Dr. Muhammad. And each year the professors in charge of the program ensure the curriculum is meeting the needs of the students. “We change the curriculum each summer. We always started off with problem solving and computational thinking, followed by building block programming and ended with Java programming. But we realized over the years that we should start them off with Java early so that they will be ready for their first programming course in the fall. And that was what we did this year,” said Chutima Boonthum-Denecke, Professor for the Hampton University Department of Computer Science. Although this program started out as grant funded, the department has had to rely on industry partners to fund the program each year. Thanks to Google, Lockheed Martin, Yahoo, and Accenture, the Department of Computer Science has been able to offer this fully funded program for the last five years. It’s important for these industry partners to contribute to programs like these because the hope is that eventually these students will work for them. For more information about the Computer Science Pre-College program, contact the Department of Computer Science at 757-727-5552.